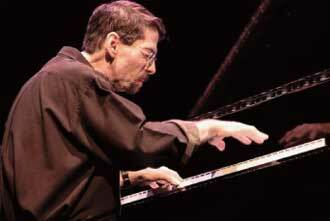 Note: On a Monday night, the 13th of October, a Seacoast audience of jazz enthusiasts was dazzled by the work of one of today’s foremost jazz pianists, Fred Hersch, in a trio format. Among the fortunate listeners was Cary Kilner, who took notes of what he heard that night, adding his own impressions, and shared them with Seacoast Jazz Notes. Here is a listing of the performances, although I did not catch all of the titles. 1. A 12/8 original; the drummer used interesting white plastic drumsticks that made a slapping sound. Fred played tonal clusters. The bass was quiet and nondescript, but just wait—he will rock later! 2. Fred’s Monk tribute was a very nice integrated trio performance with organic interplay. My good friend and pianist, Larry Lofquist, and I coined the term, “A Trio Is,” to denote this concept back during my study and practice days at 60 Pleasant Street (Cambridge, MA), where I more fully developed my harmonic conception. 4. Lonely Woman (Ornette Coleman)—I don't recall the treatment. 5. Nardis was very impressionistic, with some nice bowed bass. Fred exhibited a full command of the piano, the total relaxation that Kenny Werner exhibits and discussed in his book. Fred used lots of space and the whole keyboard top to bottom, not as pianistic “tricks” but as an organic whole. 6. Fred called this performance some kind of suite. It reminded me of how Keith Jarrett would approach such a piece, with a bit of New Orleans strut going on throughout. 7. At the Close of Day was a totally organic Fred ballad, with gorgeous harmony and a completely independent left-hand, playing in contrapuntal motion and using call-and-response with left and right hand, even more so than he had occasionally done previously. John showed some virtuoso bass playing on the student’s bass he had borrowed for the gig. 8. Tripping is a bouncy Fred original; his left hand laid out and he played single-note right-hand lines like Herbie Hancock does on the Miles quintet album, Nefertiti. There was lots of tricky yet logical playing with the time, and a totally fluid piano approach. It very much reminded me of the original innovative Bill Evans Trio of the late 1950s with Scott LaFaro and Paul Motian that represents the concept, “A Trio Is,” as does the Now He Sings, Now He Sobs late ’60s trio LP on Solid-State with Chick Corea, Miroslav Vitous, and Roy Haynes. 10. Some Other Time, the Sammy Cahn tune (not the Bernstein one), and Fred continued to exhibit exquisite touch. 11. Let's Cool One, a Monk tune, had typical jagged lines, but reminded me of a more inside and controlled Cecil Taylor, who I am hearing played a lot on jazzradio.com. 12. After an extended standing ovation, Fred returned to play his ballad, Valentine, as a solo. It was a short but very poignant performance.